Most of the product people or businesses that I speak to all seem to want one thing: to be ‘lean’. They all nod when you talk about wasting resources on making products that no wants to buy. They’ve picked up on the approach adopted by many successful startups who have got the capacity to learn and adapt rapidly to what customers want. However, large corporations have struggled to adopt ‘lean’ practices and to create a culture in which the focus is on “continuous learning”. Are big corporates geared towards releasing products in small iterations and accepting failure in the process? Trevor Owens and Obie Hernandez have published The Lean Enterprise, which is about large corporations adopting a lean startup mindset and which provides practical tools on how to best do so. Why The Lean Enterprise? What is it? I guess the main message which underpins “The Lean Enterprise” is that big businesses need to adopt “lean” practices which have been adopted by lots of (successful) startups. “Lean Startups” (a term coined by Eric Ries in the eponymous book) are geared towards determining “product/market fit” in the quickest and most efficient way possible. “The Lean Enterprise” is all about big businesses becoming more like lean startups. But can large companies really become leaner? However, the idea of an “Innovation Colony” seems to be closely modeled to “Skunkworks”, which dates back to the Fifties. The Skunkworks concept has had varying degrees of success. Even if large businesses succeed in creating an autonomous unit, I wonder if the mindset and autonomy is really there for these skunkworks to launch great innovative products. How do you inject a lean mindset of experimentation and ‘failing fast’ into organisations that have a long lasting legacy of a slow speed to market or a well ingrained culture of bureaucracy. The Lean Enterprise provides a lot of detail around lean concepts such as “product / market validation” and “innovation thesis”, but I wish it could have elaborated more on the mindset required to be be truly lean and autonomous. I wonder if it might not be easier to create a lean mindset in-house and across the organisation, rather than going down the route of creating a skunkworks unit where the large company issues might still resurface. I would love to know more about how to best tackle some of the aforementioned problems ‘at source’ and at scale. How do you transform a large company with an ‘oil tanker mindset’ into a nimble speed boat? What does it take to get people to buy into such a transformation? 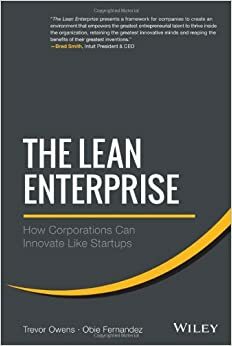 I expected The Lean Entrepreneur to focus more on such questions, as I am just not convinced that creating an Innovation Colony is the best way to making large companies more lean. Having listened recently to a talk by Shah Shelbe in which he spoke about introducing an entrepreneurial mindset into large corporates such as Boeing, I’m curious to find out more about best ways to transform cultures and mentalities of large companies, making them more nimble and entrepreneurial. The paradox of trying to introduce a lean mindset into any large enterprise is that the vast majority of employees are highly risk-averse. I’ve seen cases where employees engage in open revolt against anything that appears to undermine the “social contract” of stability implied by traditional (non-lean) business methods. These people, they’d be working for a startup already if they were capable of being lean. The innovation colony gives those that are lean-minded a place to go without exiting the overall enteprise entirely.